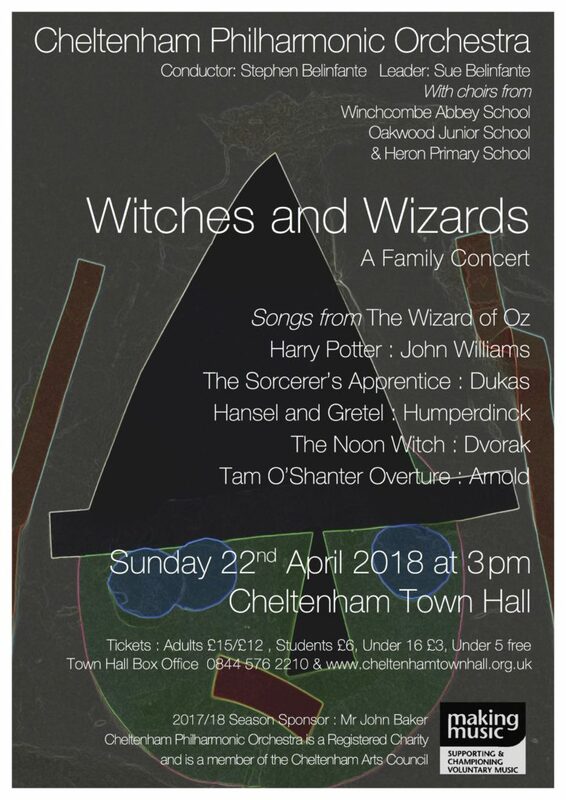 The Cheltenham Philharmonic Orchestra are delighted to present the 2018 Family concert : Witches and Wizards. This year we feature Witches and Wizards with goblins and ghouls in Arnold’s Tam O’Shanter Overture, witches in The Witches Dance from Hansel and Gretel and the Sorcerer’s Apprentice made famous by Walt Disney’s Fantasia. The Cheltenham Philharmonic Orchestra will be joined by local school choirs to perform well known songs from The Wizard of Oz. It will be an afternoon of music, fun and magic. During the concert there will be a chance for children to meet the orchestra and to play some of the orchestral instruments. Book your tickets early – last year’s concert was a sell out!